Modern surfmats are highly evolved surfcraft made using light weight, high performance materials. These materials allow mats to achieve startling speeds in the most unexpected places. However, you don’t need to be George Greenough to realize that mats are not as sturdy as some of the other craft out in the lineup. That said, a good mat can easily last you as long as a surfboard if looked after properly. Store your mat rolled up or preferably hung up using a clip hanger. Creases will weaken the nylon. Roll your mat up with the deck on the outside as this is the toughest part of the mat. Transport your mat in a bag. Some mats come with bags included but deck chair bags make the perfect surfmat case (see pic). Keep your mat out of direct sunlight when not in use. Deckchair bags make great mat bags if your mat didn't come with one..
Don’t store your mat inflated. An inflated mat is easier to puncture, and NEVER leave an inflated mat in a car. Hot mats expand and expanding mats can go BANG!!! Particularly if heat is softening the TPU backing. Wash your mat using fresh water after each surf and allow to dry naturally in a shaded place. Dale Solomonson (Neumatic Surfmats) recommends swilling the inside of the mat with fresh water from time to time although not all manufacturers support this. Also, if you carry your mat in a case or tube, don’t forget to rinse this out too. Surfmats barely break the surface when on a plane and can certainly be ridden on reefs, but watch out for exposed rocks which will rip your mat wide open. Also be aware of rocks, thorns and barbed wire when heading ‘off-piste’. When leaving the water, immediately open the remove the stopper and allow your mat to deflate as you walk back up the beach. Punctures and tears in your mat can be repaired. The following tips have been adapted from the Fourth Gear Flyer Guide. Most mats come with repair patches. 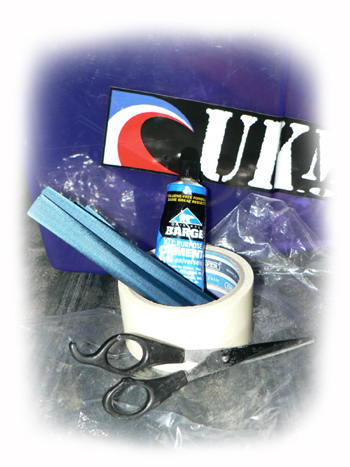 If you don’t have any patches you may find it useful to get hold of some 6oz urethane backed nylon for this purpose. Alternatively, ask if you email us we might be able to hook you up with someone who has some. Unfortunately, damaged or torn I-beams (the bits inside the mat between the pontoons) can’t be repaired. If they go, it’s time for a new mat. If traveling, we’d recommend putting together a repair kit containing cement, patches, masking tape and scissors (see pics). Rinse your entire mat with fresh water, especially around the damaged area. Hang up and allow it to dry thoroughly. Cut a piece of repair material that is about 3” longer and wider than the damaged area. Use contact cement such as Barge or Evo-Stick to make your repair. Apply Apply two layers (allowing 30 minutes to dry between the layers of glue) around the damaged area that’s about 3” longer and wider than the tear. The material will curl up slightly as the glue dries. This is fine. Just make sure that the glued surface doesn’t touch itself, as the contact cement will create an unwanted bond. For long tears, Stabilize the torn area of the mat by applying masking tape on the inside of the mat. Slip horizontal strips of tape every few inches under the torn area, and press the edges of the torn material together… So the mat looks like it did before the damage occurred, with the strips of tape underneath. Try to eliminate any wrinkles as you mate the material back together. This may take several tries to get it smooth. The tape will remain inside the mat there after the repair is made, but the benefits of a stable working surface outweigh this minor quirk. Using a small, inexpensive brush for larger repairs, or your finger for small repairs, apply a layer of cement to the repair swatch on the “fabric” (rough) side of the material. Let both areas sit for a full 30 minutes. Wait 15 -20 minutes, then press the swatch onto the torn area of the mat. Since the glue will bond as soon as the two glued surfaces touch, care must be taken when the repair swatch is applied. After the repair swatch is in place, inspect to make sure that it’s smooth, and the cement has bonded all around the patch. Remove the masking tape from the repair swatch, and let the repair sit overnight before re-inflating and using your mat. Over time, any type of grip will start to wear. The method for freshening it up differs depending on your mat. Canvas decked mats such as stock Forth Gear Flyer models respond well to a scrub with a stiff brush and a hot wax application. This is added to 4GF’s at the point of manufacture. The video on the right shows how to top this up or how to apply your own if you have a canvas decked mat of some other type, or if you think your 4GF was bought prior to the hot wax being developed. (Please note the high contrast of the video shows some residue, it is possible to have no wax visible by applying 2 very light coats). 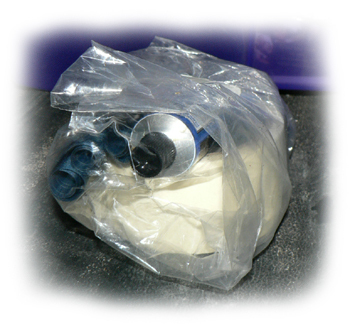 The second type of grip is that used on lighter weight fabrics where polyurethane sealants are applied. You will find this kind or grip on Neumatics, G-Mats or the 4GF Blue Streaks previously sold through our store. Over time the Grip will wear flat. It will still offer grip but if you want to get it back to its former glory then this video shows you how. We recommend using Sikaflex EBT, rather than Vulkem 116, as it releases lower levels of VOC's, has good sticking power and is durable. You can email us if you have any questions about this.